1. Headbox: Air-cushion headbox, by controlling the gas pressure inside the headbox to control and stabilize the pulping pressure head. 2. 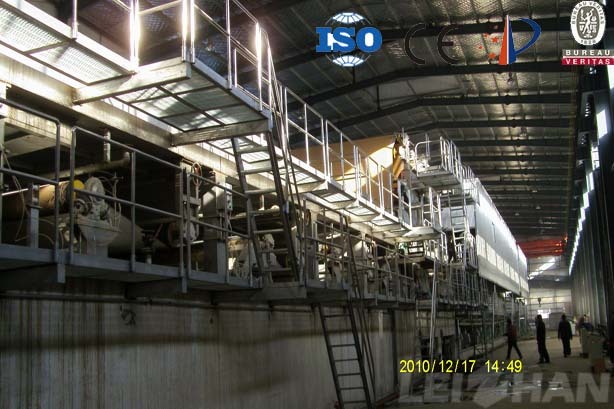 Wire Section: Single fourdrinier wire, the main components: breast roll, forming plate, dehydration board, vacuum box, vacuum couch roll, wire-driving rollers, wire-guiding roll and rack, etc, and equipped with a piece of forming wire. 3. Press Section: it is divided into 1st press, 2nd press. 1st press is the press with large diameter roll with a vacuum suction roller, equipped with two coating metal rollers, and with upper felt and lower felt; 2nd press is large diameter roll, equipped with two coating metal rollers, and with upper felt and lower felt. 1st press, 2nd press are equipped with leading felt roller and felt suction box. 1st press, 2nd press pressurized way is oil hydraulic cylinder pressure. 4. Front Dryer Section: Φ1800 dryer cylinder, group drive, each group with dryer wire, wire-guiding roll. Equipped with semi-enclosed gas hood. 6. Back Dryer Section: Φ1800 dryer cylinder, group drive, each group with dryer wire, carrier roll. Equipped with semi-enclosed hood.